CHEMICAL safety cabinets are a commonplace and sensible way to store hazardous materials in the laboratory, but can present their own safety challenges says Air Science. 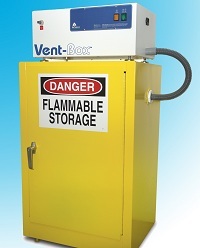 Its new Vent-Box ductless filtration system is designed to protect laboratory personnel from the chemical vapours that can be found inside standalone chemical safety cabinets. Vent-Box employs Air Science’s multiplex filtration system, a unique arrangement which includes both a pre-filter and main filter. This combination, the company says, will adsorb, neutralise, or trap the target chemicals or particulates while constant negative pressure removes vapours and particulates from the interior of the cabinet. Fumes are pulled via a flexible hose connected to the cabinet, and clean filtered air is returned to the laboratory, eliminating the need for external ducting and minimising loss of treated, conditioned air from the facility. The Vent-Box is available in a variety of configurations to match the vapours or particulate removal requirements.